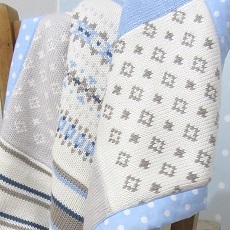 A contemporary patchwork blanket for babies featuring traditional Fairisle design. Beautiful handmade knitted baby blanket, incorporating 12 individually knitted squares featuring traditional fairisle design and variety of stripes. Knitted in pale and dark blue, silver grey, cream and taupe. This patchwork blanket is backed with a pale blue fabric with white printed spots. All Smitten baby blankets are lightly padded for extra comfort. This design is also available in pink. The greatest care goes into selecting all components of Smitten products. The woven fabric used to back this knitted baby blanket has been handpicked to compliment the motif design and soft yarn colours shown on the front. For a unique personalised baby gift, Smitten knitted blankets can be customised with a name, initials and/or date of birth (up to 7 characters). To personalise your patchwork baby blanket please select ‘personalised’ from the drop down menu and enter your required text in the box. If you would like to customise your knitted blanket with more than 7 characters, please contact us for a quote.